Today is a cooler day here with a bit of wind and some showers, a perfect day to be inside creating something. I made this card a couple weeks ago for my husband for his birthday but never shared it with you yet, seems like a waste not to ...so here goes. I made a vertical stair card. I have seen these type of cards on the internet but have never created one for myself. I tried to get a template but the sizes of them didn't seem to match the size of card I wanted to make. I typically make 6 x 6 cards, so when the templates never matched I sat down to create my own. I'm not going to lie it quite sometime to make it work and have all the measurements the same on the stairs but I finally got it and love the outcome of it. 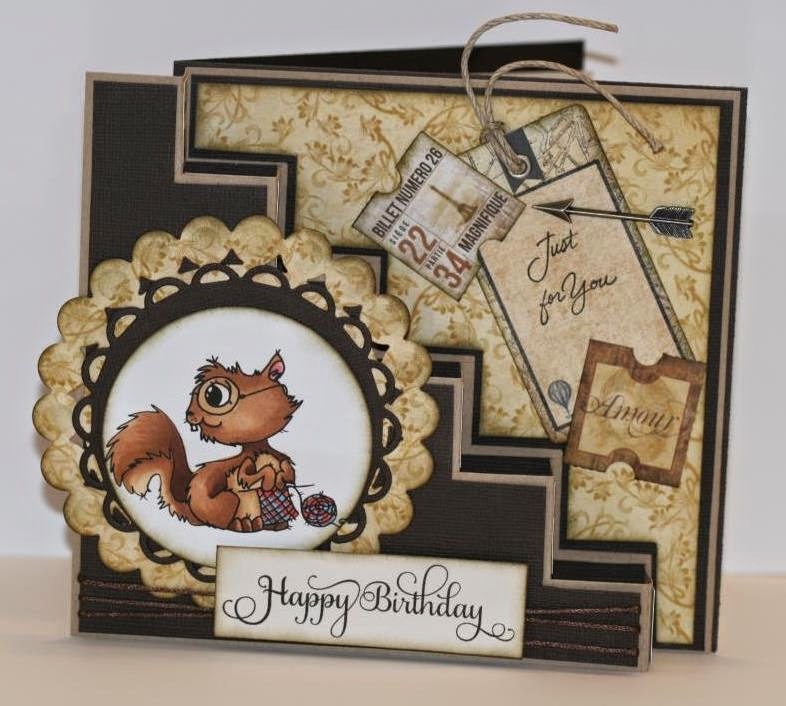 I create this card using a sure cute image from Whimsy Stamps by designer Miss Rach called Crafty Squirrel, colored it with copics and used earthy colors to match to make the card. 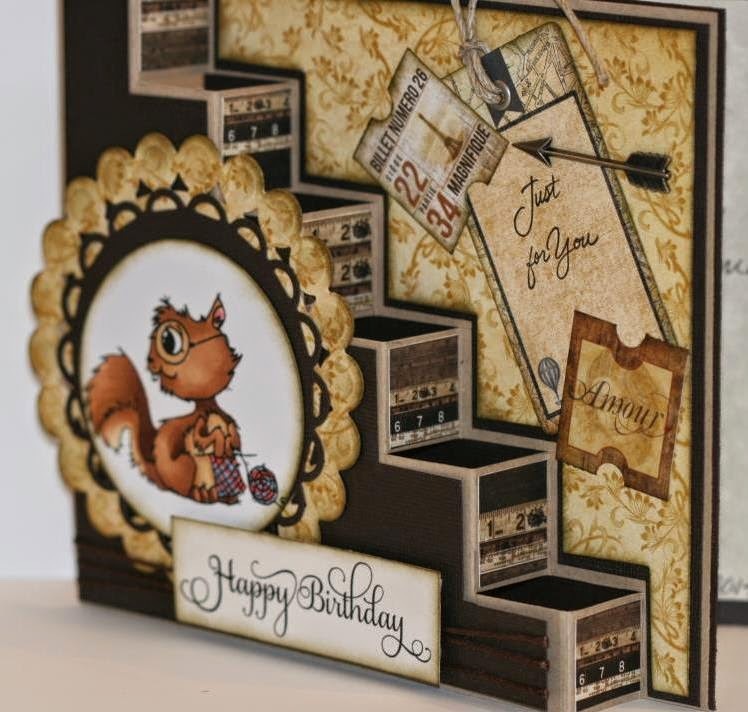 My card is a 6 x 6 card, the front piece is a piece of cardstock measuring 7 5/8" wide by 5 7/8" high. From the top left corner I measured down 1" and made a vertical line( which you score), from there I made another line horizontal this time 2 " long ( which you cut with your trimmer). This is the format that I used all the way down the stairs until I was at the bottom right corner. Once I cut and scored all the stairs I then center it on the front 6 x 6 piece of my card. I hope that you understand what I am explaining. It's hard to explain a template, but if you think of the way stairs work it does make total sense. I think the picture helps as well, then I added pattered paper to each of the stairs so it complimented my card. Aren't these the fun cards to create? Great colors and he is so super cute awesome job!